An exhibition of Thracian gold items, found in the Plovdiv region, was sent on a tour to Italy, where for a month it is going to be exhibited at the presidential palace Quirinale (Palazzo del Quirinale) as reported by the National History Museum Director, Bozhidar Dimitrov. The collection includes a gold wreath, gold ring, golden rhythons in the form of deer?s head, richly decorated knee-supporter from the grave of a Thracian ruler dated 4th century B.C. near the village of Zlatinitsa, Yambol region. 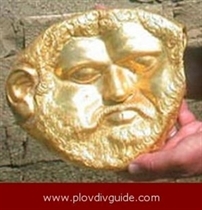 The gold mask believed to display King Teres, found by Prof. Kitov.